FRHA President Michael Ham-Ying presents the 2017 Rural Physician of the Year Award to Dr. Terry Soldo of St. Vincent's Healthcare during the 2017 FRHA Summit Feb. 28th in Gainesville. Soldo is joined by his St. Vincent's colleagues. FRHA President Michael Ham-Ying presents the 2017 Rural Physician of the Year Award to Dr. Edwin Moore of Shands Live Oak Regional Medical Center during the FRHA Rural Health Educational Summit, Feb. 28th in Jacksonville. Sharon Schmidt (right), Florida Rural Health Association president, presents Dr. Miles Nelson the 2013 Rural Physician of the Year Award Thursday, November 21 in Gainesville, Fla. during the FRHA 20th Annual Educational Summit. 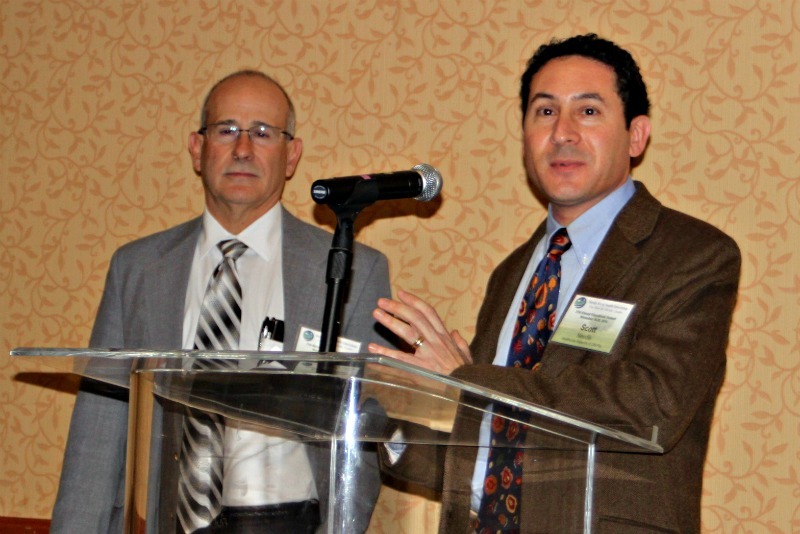 Dr. Jose Quero (left), the 2014 Rural Physician of the Year, with his colleague Scott Needle from the Healthcare Network of Southwest Florida Thursday, November 20 in Orlando, Fla. during the FRHA 21st Annual Educational Summit. Dr. Jose Quero (third from left), the 2014 Rural Physician of the Year, with his colleagues from the Healthcare Network of Southwest Florida Thursday, November 20 in Orlando, Fla. during the FRHA 21st Annual Educational Summit. Kim Barnhill, Florida Department of Health Chief of Staff, presents Dr. Udayashree Nune the Rural Physician of the Year Award Thursday, Nov. 15 at the 2012 FRHA Educational Summit in Safety Harbor. The FHRA Board of Directors established this award to recognize outstanding health care delivery leadership in rural Florida. Rural Physicians are the backbone of rural healthcare and often work in less than stellar situations. With its annual presentation. FRHA will honor a rural physician who works to keep Floridians healthy. The Rural Physician of the Year Award is presented to an individual who has contributed to the goals of FRHA and who provides an enduring contribution to rural health care. The individual is honored for his/her quality health care provision. patient care and commitment in seeking solutions in the delivery of rural health care or quality of life in rural Florida. JACKSONVILLE, Fla., March 1, 2017 - The Florida Rural Health Association is proud to announce Dr. Edwin Moore of Live Oak as the 2017 Rural Physician of the Year. With a heart for helping the rural and often underserved community, Moore volunteers his time at Shepherd’s Hands of Suwannee Valley Inc., a free health clinic in Live Oak. The clinic provides services for people not covered by health insurance and making less than 200 percent of the Federal Poverty Level. Moore has also traveled to other rural communities and around the world to provide free medical care. Moore was presented the award during the 23rd annual FRHA Educational Summit on February 28 in Jacksonville, Fla.
“The honor is not solely mine,” Moore said after accepting the award. The nurses, clerks, technicians, staff and administration are critically important to allowing me to doctor, he said. “Those are the folks that make a difference,” Moore said. In addition to his time at the free clinic, Moore is an active emergency room physician and the medical director at Shands Live Oak Regional Medical Center, a critical access facility in Live Oak, FL. Moore gained diverse medical experience during his 41-year military career, which included overseas tours and serving as the senior medical advisor to the Task Force Commanders and the Director of Flight Surgery. He also served as the State Surgeon for the Florida JROTC program for six years, reviewing fitness standards for JROTC participation and serving as the medical expert for questions on cadet health issues. “Dr. Moore is a wonderful physician, educator, mentor, and advocate for the residents of our rural community,” said Jennifer Grafton and Donna Ragan, Moore’s colleagues and nominators for the award. JACKSONVILLE, Fla., March 1, 2017 - The Florida Rural Health Association is proud to announce Dr. Terrence Soldo of Jacksonville as the 2017 Rural Physician of the Year. Soldo provides free medical care to some of the most vulnerable residents of Northeast Florida: agricultural farm workers. Each month, Soldo travels 140 miles with St. Vincent’s Mobile Health Outreach Ministry (MHOM) to provide services to farm workers and their children in Putnam and St. Johns counties. The mobile clinic provided 2,231 free services in 2016. One patient, a migrant farm worker, sought Soldo’s help for a tumor on his forehead. In a testament to Soldo’s dedication, he removed the man’s persistent tumor three times. Soldo also found an oncologist to volunteer 30 radiation treatments and a surgical team to remove the tumor for good. Soldo was presented the award during the 23rd annual FRHA Educational Summit on February 28 in Jacksonville, Fla.
One day, Soldo said, he hopes there will not be a need for free clinics because everyone will have access to healthcare. As the Director of Osteopathic Training at St. Vincent’s Family Medicine Center and Residency Program, Soldo provides future primary care physicians with hands-on knowledge and skills. He also requires resident physicians to spend time working in the mobile clinic, fostering the spirit of community outreach in future generations of physicians. Soldo is the medical director for the MHOM, in addition to volunteering as a clinician and board member of The Way Free Clinic in Green Cove Springs and the medical director for the Putnam County Medical Mission in Crescent City. Soldo served in the U.S. Navy for 36 years and provided care to service men and women around the world. He retired as a Commander in 2005.